Here are some links to information all snowmobilers should know. As a snowmobiler it’s your responsibility to know current State law regarding the use and operation of a snowmobile. It’s also important to adhere to posted trail signs and show respect to the landowners who allow snowmobilers access to their lands. 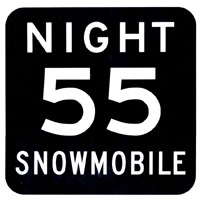 If you were born on or after Jan. 1, 1985, and are at least age 12, you must complete a snowmobile safety certification course to operate a snowmobile on Wisconsin public snowmobile trails and areas. DNR recreational safety specialists recommend snowmobile operators complete a safety course. Visit the Wisconsin DNR Web site for more information on snowmobile safety courses. Search for Snowmobile Safety Classes being held near you (Check back as this list is updated frequently). Go to snowmobilecourse.com for online safety course options. Here are some safety tips we should keep in mind while on the trails. The 55 mile per hour nighttime speed limit applies to all areas statewide from half an hour after sunset to half an hour before sunrise. For more, visit our Snowmobile Safety page.